MetaWear is back on Kickstarter. The affordable wearable tech and internet of things platform has been a hit with makers and engineers and now MBient Lab has announced its latest low power board, the MetaWear Coin. Available now on Kickstarter for an Early Bird price of $49 (150 available) or standard price of $69, the Coin is - as the name suggests - both tiny and powered by a coin cell battery which will last three to six months. Estimated delivery is October for Early Birds and November for everyone else and MBient Lab is looking to raise $50,000. The module packs in a low power ARM processor, 16GB RAM, 256KB of flash memory, built-in Bluetooth Low Energy, an on-board LED, a case with a simple push button and sensors including an accelerometer and a temperature sensor. The Coin also has the ability to work with additional sensors and LEDs should makers wish to add more. In fact there's everything startups and tinkerers need to start building wearables with iOS and Android SDKs and even proprietary MetaSense software for analysing sensor data, tracking motion and gestures, processing user input and triggering functions. Compared to the original MetaWear board, the Coin is smaller, uses less power and lasts longer. The exact size of the module, in the case, is 8mm x 34mm x 34mm. 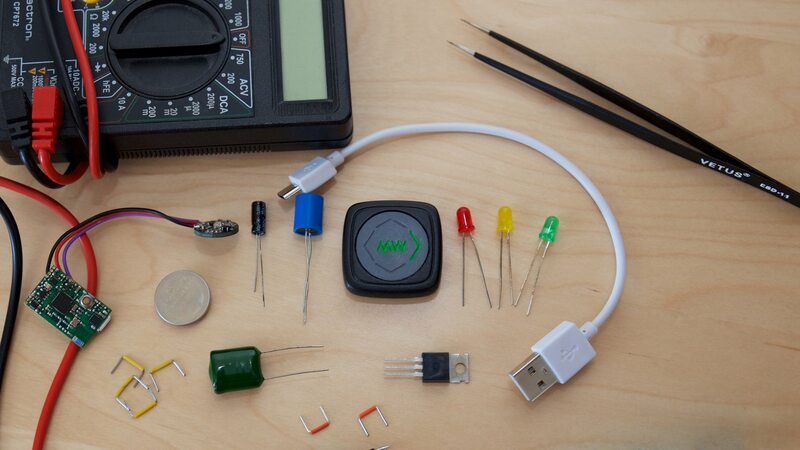 Laura Kassovic, CEO of MBient Lab told Wareable that "what Arduino did for schools, we want to do for wearables." Like Arduino, the open source prototyping platform used by millions of makers and hobbyists to turn low budget concepts into real models and to teach students getting started in electronics, MetaWear is simple, affordable and user friendly. Kassovic and her team aren't alone in their bold ambitions. Intel is trying to become the go-to tech in the wearable world with its button sized Curie module due later in 2015. But one thing MBient Lab has, that some big players don't, is an existing and supportive community. "The first MetaWear sensor was a stepping stone in creating the perfect wearable platform," said Kassovic. "With the help of our amazing community, we know which sensors we should include in future designs and which features matter most. Everyone was asking for a case with a button so we made it, it's that simple!" It's not the MBient CEO's job to decide how backers will use MetaWear Coin but the Kickstarter campaign features some neat examples of device ideas which work with its sensors and size including (big, cocktail) smart jewellery that flashes when you get a phone call and a smart handbag that knows when you've left it behind. "This platform is also great for motion related application," she said. "Think about tracking a robotic arm, a mountain biker or a baseball swing. We can add a MetaWear Coin to a pair of boxing gloves and tell you instantly how strong your punches are." If you're looking to back a campaign with previous form, MBient Lab delivered its first product, launched in 2014, early and is still very involved with the MetaWear community. "We've seen some wonderful projects," said Kassovic. "For example, MovementInteractive Inc out of Arizona is making concussion detecting headbands that reduce sports injury for young football and soccer players with MetaWear. It's quite wonderful to be able to be part of something positive and see someone create something meaningful with your platform."